Walter Frederick "Fritz" Mondale (born January 5, 1928) is an American politician who was the forty-second Vice President of the United States (1977–1981) under President Jimmy Carter. He was a two-term United States Senator from Minnesota. Mondale was the Democratic Party nominee for president in 1984. He lost to Ronald Reagan. Mondale was the first Vice President to have an office. He made the role of Vice President more important than it once was. 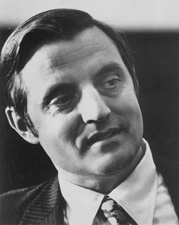 ↑ "U.S. Senate: Walter F. Mondale, 42nd Vice President (1977-1981)". www.senate.gov. ↑ CNN, Ralph Ellis, Faith Karimi and Deborah Doft. "Former VP Walter Mondale released from hospital". CNN.